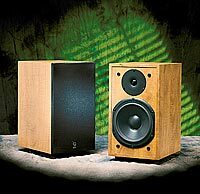 The Qln 601 is a compact loudspeaker with a stunning ability to recreate a very large and spacious sound stage. It has a wide dynamic range and is designed to work equally well in Home Theatre applications as well as in traditional Hi-Fi systems. The 165 mm low-mid unit has a lightweight fibre cone which provides a natural bass and a very clear and detailed midrange. It meets the 20 mm dome tweeter well and presents an uncoloured high midrange and a distinct high end performance. High-density board with high internal damping reinforces the impression of natural and detailed sound reproduction. With the genuine built-in Qln quality and our attention to detail, the Qln 601 will bring you an excellent combination of compact size and premium sound quality. Reflex port with rounded edges and large area for lower distortion. High efficiency for extended dynamic range. 20 mm fabric dome tweeter ferrofluid cooled for high power handling. 165 mm mid/bass driver with well damped lightweight fibre cone, non magnetic chassis and high flux magnetic system. Slim cabinet design with drivers arranged close to each other for distinct stereo image. Cabinet construction of high density board with high internal damping to eliminate structural resonances and colorations. Optional finishes; cherry, light rose and black.